doTERRA Women Phytoestrogen Lifetime Complex is a blend of natural plant extracts that support hormone balance throughout the different phases of a woman?s life. Phytoestrogen Lifetime Complex includes a standardized soy extract with genistein, a powerful phytoestrogen that binds with estrogen receptors in cells, and the natural phytoestrogens in pomegranate. It also includes and concentrated extract of flaxseed lignans to help manage potentially harmful metabolites that are produced when estrogen is metabolized in the liver. Balancing hormones and managing harmful metabolites by eating a healthy diet rich in phytoestrogens and other essential nutrients, exercising, and managing weight can help reduce uncomfortable symptoms associated with PMS and the transition through menopause and supports healthy bones, heart, breast tissue, and other body structures and functions as a woman ages. 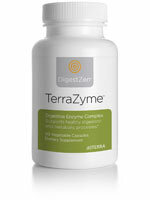 doTERRA TerraZyme Digestive Enzyme Complex is a proprietary blend of active wholefood enzymes and supporting mineral cofactors that are often deficient in cooked, processed, and preservative-laden foods. TerraZyme's powerful combination of digestive enzymes support the body's constant production of enzymes critical for healthy biochemical functions throughout the body including healthy digestion of food nutrients and cellular metabolism of nutrients to energy. TerraZyme includes a variety of whole-food enzymes that help with digestion of proteins, fats, complex carbohydrates, sugars and fiber. 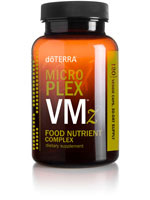 doTERRA's Microplex VMz Food Nutrient Complex is an all-natural, whole-food formula of bioavailable vitamins and minerals that are deficient in our modern diets. 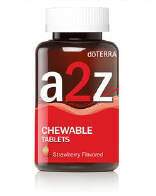 The formula includes a balanced blend of essential antioxidant vitamins A, C, and E, and an energy complex of B vitamins presented in a patented glycoprotein matrix. It also contains food-derived minerals of calcium, magnesium, and zinc and trace minerals for optimal bone and metabolic health. Microplex VMz contains doTERRA's Tummy Tammer botanical blend of peppermint, ginger, and caraway to calm the the stomach for those who may have experienced stomach upset with other vitamin and mineral products. Microplex VMz is encapsulated using sodium lauryl sulfate-free vegetable capsules, does not contain wheat or dairy products, and does not include any animal products. doTERRA Alpha CRS+ Cellular Vitality Complex is a proprietary formula combining potent levels of natural botanical extracts that support healthy cell proliferation and lifespan with important metabolic factors of cellular energy to help you live younger, longer. Alpha CRS+ is formulated to be used daily with xEO Mega and Microplex VMz as a comprehensive dietary supplement foundation for a lifetime of vitality and wellness. 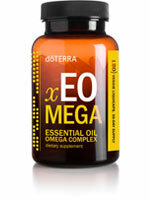 doTERRA xEO Mega Essential Oil Omega Complex is a unique formula of CPTG Certified Pure Therapeutic Grade essential oils and proprietary blend of marine and land-sourced omega fatty acids. Omega fatty acids help support healthy joint, cardiovascular, and brain health, support healthy immune function, and have been shown to help mediate healthy inflammatory responses in cells. A single daily dose of xEO Mega provides 1000 milligrams of marine lipids with 340 mg of EPA and 240 mg of DHA and a blend of plant-sourced essential fatty acids. xEO Mega also includes 800 IU of natural vitamin D, 60 IU of natural vitamin E, and 1 mg of pure astaxanthin, a powerful antioxidant carotenoid harvested from microalgae. The bioavailability of the xEO Mega formula is enhanced through a nanosomal lipid assimilation system. Be ready with all the products you need for the 2012 Slim and Sassy Lifestyle Change Competition with the Slim & Sassy New You Kit. Reach your goals and slim down by using Slim & Sassy on a regular basis throughout the day along with doTERRA Trim Shakes and the Lifelong Vitality Pack. Slim & Sassy New You Kit includes 4 Slim & Sassy 15 ml metobolic blends, two chocolate TrimShakes (40 servings), and the Lifelong Vitality Pack. Be ready with all the products you need for the 2012 Slim and Sassy Lifestyle Change Competition with the Slim & Sassy New You Kit. Reach your goals and slim down by using Slim & Sassy on a regular basis throughout the day along with doTERRA Trim Shakes and the Lifelong Vitality Pack. Slim & Sassy New You Kit includes 4 Slim & Sassy 15 ml metobolic blends, two vanilla TrimShakes (40 servings), and the Lifelong Vitality Pack. Be ready with all the products you need for the 2012 Slim and Sassy Lifestyle Change Competition with the Slim & Sassy New You Kit. Reach your goals and slim down by using Slim & Sassy on a regular basis throughout the day along with doTERRA Trim Shakes and the Lifelong Vitality Pack. Slim & Sassy New You Kit includes 4 Slim & Sassy 15 ml metobolic blends, one vanilla and one chocolate TrimShake (40 servings), and the Lifelong Vitality Pack. doTERRA's lifelong vitality supplements are formulated with potent levels of essential nutrients and powerful metabolic factors for optimal health, energy, and longevity. Coupled with doTERRA's CPTG Certified Pure Therapeutic Grade essential oils and a lifelong commitment to doTERRA's wellness lifestyle, they naturally support a lifetime of looking, feeling and living younger, longer. Women begin to build bone mass at an early age reaching a maximum bone density in their late twenties. As a woman ages, bone mass begins to decline and bones become more brittle. Declining bone density and health can be accelerated in women whose diets do not include optimal levels of bone nutrients and whose hormones are out of balance. Not managing harmful estrogen metabolites can also accelerate bone degeneration or wasting. doTERRA's Bone Nutrient Lifetime Complex is a blend of vitamins and minerals that are essential for bone health including vitamins C and D, calcium, magnesium and other trace minerals. 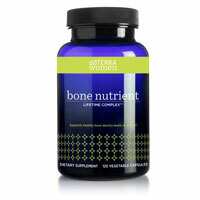 Bone Nutrient Lifetime Complex can be used by women (and men) of all ages as a dietary supplement to conveniently increase consumption of the bone nutrients found in healthy foods but often deficient in our modern diets. PB Assist+ Probiotic Defense Formula is a proprietary blend of pre-biotic fiber and six strains of probiotic microorganisms in a unique double-layer vegetable capsule delivering 5 billion CFUs of active probiotic cultures and soluble pre-biotic FOS (fructo-oligosaccharides) that encourages culture adhesion and growth. The time-release double-capsule delivery system protects sensitive probiotic cultures from stomach acid. PB Assist+ supports healthy digestive functions and immunities and is safe for use by all members of your family. doTERRA's GX Assist is a proprietary combination of Certified Pure Therapeutic Grade essential oils and caprylic acid that help support a healthy digestive tract by creating an unfriendly environment for potentially harmful pathogens that can disrupt digestive immunities and cause digestive upset. GX Assist is formulated with therapeutic-grade oregano, melalueca, lemon, lemongrass, peppermint, and thyme essentials oils that have been demonstrated to have in-vitro antimicrobial properties. GX Assist also includes caprylic acid that has been traditionally used as for its specific health-supporting properties in the gut. Don't let flu season catch you off guard! 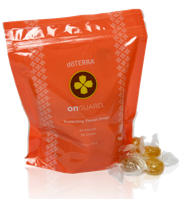 doTERRA's On Guard Protecting Throat Drops provide a convenient way to benefit from On Guard's immune-supporting properties. With all-natural organic cane juice and organic brown rice syrup, these drops help support fixed and mobile immune function*, and can help calm and soothe dry, scratchy throats. Chocolate Slim & Sassy TrimShake is a convenient and delicious shake mix providing the essential nutrients of a healthy meal with only 125 calories per serving. Used as a meal replacement for one or more meals each day, TrimShake can help you lose unwanted fat stores through calorie restriction and regular exercise. TrimShake also includes a patented weight-loss ingredient EssentraTrim that has been demonstrated to help with managing the stress hormone cortisol associated with fat storage. TrimShake blends well with water or milk for a low-calorie, low-glycemic, high-fiber satisfying meal alternative with 16 grams of protein per serving. Vanilla Slim & Sassy TrimShake is a convenient and delicious shake mix providing the essential nutrients of a healthy meal with only 125 calories per serving. Used as a meal replacement for one or more meals each day, TrimShake can help you lose unwanted fat stores through calorie restriction and regular exercise. TrimShake also includes a patented weight-loss ingredient EssentraTrim that has been demonstrated to help with managing the stress hormone cortisol associated with fat storage. TrimShake blends well with water or milk for a low-calorie, low-glycemic, high-fiber satisfying meal alternative with 16 grams of protein per serving. Kick off your weight loss goals with the Slim & Sassy Trim Kit. Slim down by using Slim & Sassy on a regular basis throughout the day?even topically, together with doTERRAs new Trim Shakes. TrimKit includes 4 Slim & Sassy 15 ml blends and two vanilla TrimShakes (40 servings)?the product you need to keep you on track with weight-loss. Kick off your weight loss goals with the Slim & SassyTrim Kit. Slim down by using Slim & Sassy on a regular basis throughout the day?even topically, together with doTERRAs new Trim Shakes. TrimKit includes 4 Slim & Sassy 15 ml blends and two chocolate TrimShakes (40 servings)?the product you need to keep you on track with weight-loss. Kick off your weight loss goals with the Slim & Sassy Trim Kit. Slim down by using Slim & Sassy on a regular basis throughout the day?even topically, together with doTERRAs new Trim Shakes. TrimKit includes 4 Slim & Sassy 15 ml blends, one chocolate TrimShake (20 servings) and one vanilla TrimShake (20 servings)?the product you need to keep you on track with weight-loss.